If you use common household cleaners, you could be slowly poisoning your dog without even knowing it. You could be putting your pooch at risk for developing cancer, kidney or liver damage down the road. In fact, studies have proven the toxic effects of such ingredients as ammonia, bleach, chlorine, glycol ethers and formaldehyde on humans and pets. And pets are even more vulnerable. Pets pick up residues from cleaning products and then groom themselves, spreading these toxic materials on their skin, coat, mouths, nose and eyes. As a responsible dog owner, it’s time to ditch your chemical-laden cleaners for pet safe cleaning products! Which Cleaning Products are the Most Harmful to Pets? 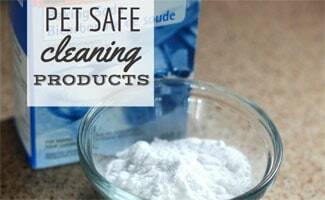 What Are Some Pet Safe Cleaning Products? The great thing about pet safe cleaning products? 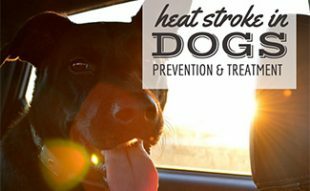 You’re not only protecting your pets, but also your children and other members of your family. If you want to go all out and eliminate all manufactured cleaners, there are some typical household products that make great, all-natural DIY household cleansers. They’re easy (and really inexpensive) to throw together. Odor absorbent: Baking soda is a natural odor absorbing product — sprinkle it on carpeting and wood floors to absorb pet accidents. Mild abrasive: Mix baking soda with equal parts hot water and salt to create a mild abrasive scrubbing product you can use for counter tops, sinks, etc. Just rinse when you’re done! Foaming cleanser: Use baking soda and lemon juice as a replacement for foaming cleansers for your bathroom and kitchen. Wood floor cleaner: White vinegar diluted with warm water makes a great pet friendly floor cleaner for wood surfaces. All-purpose cleaner: Dilute 1/2 cup of white vinegar with 1 gallon of water and pour the mixture into a spray bottle to replace an all-purpose cleaner for surfaces. Tip: Add lemon juice if you don’t like the scent of vinegar. Window cleaner: Mix 1 cup of white vinegar with 1 cup of warm water to use as a window cleaner. Carpet stain cleaner: To use as a carpet stain cleaner, combine 1/2 cup of white vinegar with 2 tablespoons of salt until the salt dissolves. Soak a wash rag with the solution to rub out the stain. Heavy carpet stain cleaner: For heavy carpet stains, mix 1/2 cup white vinegar, 2 tablespoons of salt and 2 tablespoons of Borax until it’s all dissolved. Use a rag soaked in the solution to treat heavy stains. Laundry stain remover: Include some Borax in place of bleach into your laundry load to whiten your clothes. Furniture polish: Add lemon juice to mineral oil for an all-natural furniture polish. If you don’t have the time for DIY cleansers, no worries! There are still a number of pet safe cleaners on the market worthy of consideration. Here are some of our recommendations, based on our research. What Do You Do if You Suspect Pet Poisoning? Is your furry friend showing signs of poisoning? 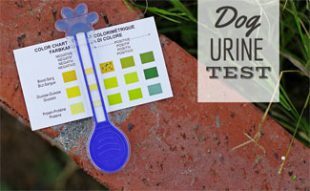 If your curious pup got into a toxic household cleaner or drank toilet water laced with a cleanser, what’s the best action to take? The American Society for the Prevention of Cruelty to Animals (ASPCA) has an excellent Animal Poison Control Center (APCC) available 24/7/365. Call them immediately at (888) 426-4435. The center is manned by committed animal lovers, who will give you expert veterinary advice. Check out this fun video the ASPCA APCC put together to encourage you to call them. As a responsible pet owner, you invest so much time and effort in the training, health and happiness of your dog. But don’t let what you don’t know compromise your pup’s well-being. We hope we’ve given you some sound guidelines about how to prevent long-term poisoning from everyday household toxic cleaners. 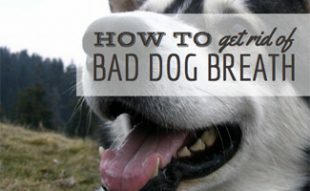 It’s worth the minimal effort to switch over to pet safe cleaning products for your pup’s sake (and your entire family’s)! What are your favorite pet-friendly cleaning products? Great article! I have 2 dogs and 2 cats. They are always sniffing the floor and licking things. I switched over all my cleaning products to plant-based, toxic free chemicals. They are sooo safe they don’t even have child proof caps! Now I feel a whole lot better about my pets. Thank you for this information. However lemons and limes are considered toxic for both cats and dogs and you have suggested adding lemon to your DIY cleaning solutions. Perhaps it’s not as dangerous when does diluted in a gallon of water. I’m not sure how much or how little it takes to be toxic. I too have read that cats cannot process essential oils through smelling and entering their blood stream. Like a bad exhaust would do to humans.